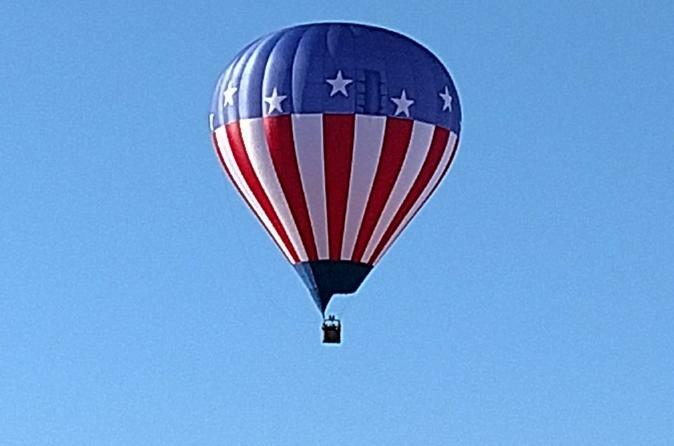 Enjoy a once in a lifetime experience of taking a 45-60 minute hot air balloon flight in Las Vegas. Be prepared for 360° breathtaking views of all the magnificent sites Las Vegas has to offer, whether it is a private exclusive flight for two people or a shared basket flight for up to 14 passengers per balloon. Flights are available year round for the mornings and afternoon flights are available November thru February. Hotel transfer available from select hotels for an additional fee. Valid for guests up to 280 lbs. Surcharge for guests 281 - 350 lbs. Please email vegashotair@gmail.com or call +1 702.468.2426 for payment. Upon arrival at the launch site, watch the crew work their magic getting the balloon set up, preparing for your unique hot air balloon flight. If you would like to be an honorary crew member for the day and help set up, that is all part of the experience. Once in the air, your pilot will point out various points of interest like Red Rock Canyon, the surrounding mountains, The Las Vegas Strip, and occasional spotting of wildlife native to the southern Nevada desert. Because balloons float with the wind, no two flights are the same so be sure to bring your camera to create and capture your personal adventure. After the flight, passengers are welcome to participate with the crew in packing the balloon away, followed by a post flight toast to celebrate your journey.